What is the nature or character of being human? "His nature -- if that is what can be used in reference to man, who has invented himself by saying "NO" to nature -- consists of his longing to realize himself in another." 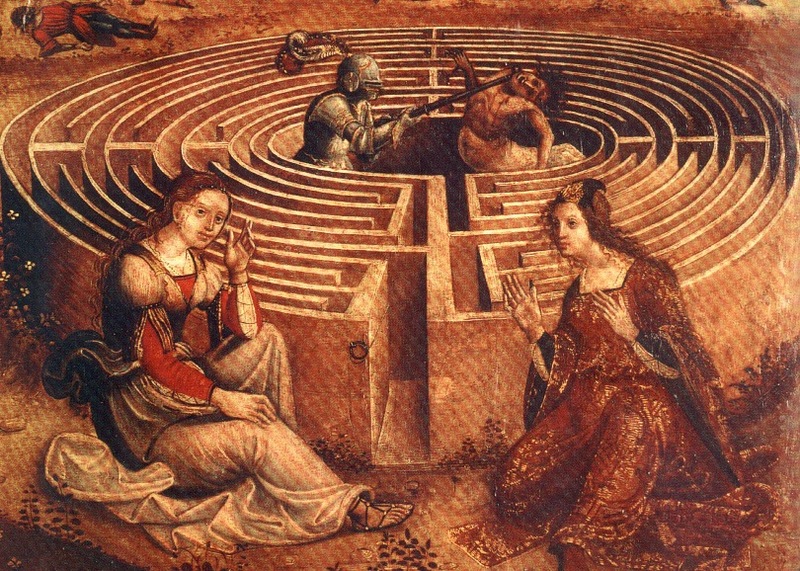 Labyrinth -- one of the most fertile & meaningful mythical symbols, the TALISMAN, or the object of restoring health and freedom to a people at the center of a sacred area." "The feeling of solitude ... is a longing for a place." "The myth of the labyrinth pertains to this set of beliefs. Several related ideas make the labyrinth...at the center of a sacred area...or enchanted place...."
"In the Perseus myth the mystical elements are almost invisible,"
"We have been expelled from the center of the world and are condemned to search for it through jungles and deserts or in the underground mazes of the labyrinth." Have we diminished the significance of food? "Snacking has supplanted meal taking." "Food may be no more than a sign of yet larger, more fundamental processes--or so it seems. Diet is remade because the entire productive character of societies is recast and, with it, the very nature of time, of work, and of leisure. If these occurrences raise questions for us and about us--if they seem to others as they seem to me, to have escaped from human control even though they are very much the outcome of organized human intent--then we need to understand them far better than we do." "But the place of sugars in the modern diet, the strangely imperceptible attrition of people's control over what they eat, with the eater becoming the consumer of mass-produced food rather than the controller and cook of it,...the paradoxical narrowing of individual choice, and of opportunity to resist this trend in the guise of increasing convenience, ease, and 'freedom'--these factors suggest the extent to which we have surrendered our autonomy over our food." We need to understand how the world works if we are to either adapt to it or to change it. "Sucrose...epitomized the transition from one kind of society to another....a total remaking of its economic and social basis. We must struggle to understand fully the consequences of that and kindred events, for upon them was erected an entirely different conception of the relationship between producers and consumers, of the meaning of work, of the definition of self, of the nature of things. What commodities are and what commodities mean would thereafter be forever different." "Had he known of the ultimate influence of maize and potatoes, humble American crops already growing in European soils, he would have been more impressed with his century. Calories can make as much history as cannons--more in the long run." the symbolic arises from an attachment, an appetite, an overweening desire to find meaning in even the most absurd situations. Whether as sources of petroleum, cocaine, sugar, coffee, bananas, or bauxite ore for aluminum, the Caribbean and Mexico are not the Renaissance paradise we have romanticized about existing among these tropical islands and shores. Instead here is the breeding ground of new cultures that have broken the western illusions of equality, independence and redemption. 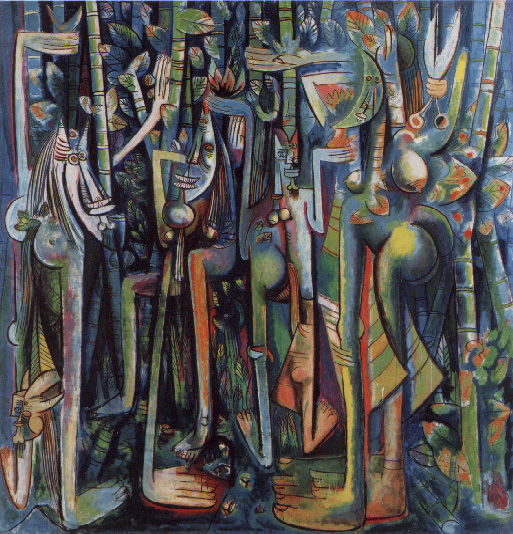 In mixing these broken shards of Euro-American idealism with the reality of race prejudice, commercial agriculture and religious synthesis of African, Asian and indigenous spiritual beliefs, the America's emerged as a crucible of modern, industrial and commercial relations that went on to reformulate the world beyond our capacity to comprehend or even recognize what we see. The mixture we see among Asian, African and Indigenous elements is actually and enduring, creative strength of the American experience where the Hindu and Christian faiths walk side by side with Santaria, Vaudon and Moslem beliefs because of the imperial, commercial and colonial past. These new beliefs like the new diets that emerged from the blending of American and Asian staple crops persist despite our efforts to homogenize, franchise and sanitize our view of work, nutrition, and living. Thus our southern neighbors, instead of being the home of inferior societies are older, more complex and tolerant than are we. Maze, an arrangement of walls with a single entrance and no exit. Figuratively, the mirrors we confuse ourselves with mistaking what we believe we see with what we do see.